Lane Limited has turned to a new, breakthrough technology to create the striking appearance of its Artistica pipes. Multi-lamination colored wood is turned into a smoking pipe and then finished off with a briar lining in the shank and bowl. Two colors are available in six shapes. Manufacturer's suggested retail price, $75. Lane Limited, 2280 Mountain Industrial Boulevard, Tucker, GA 30084, Tel: (770) 934-8540, Fax: (770) 9389473. Joel Farr, publisher of the quarterly Pipe Friendly digest, has released an interesting new resource with a "decided slant toward pipes" - the Smoker s Yellow Pages. In addition to 1,500 retail listings, this unassuming booklet lists suppliers of pipes, cigars, tobacco, and accessories, manufacturers, and distributors. 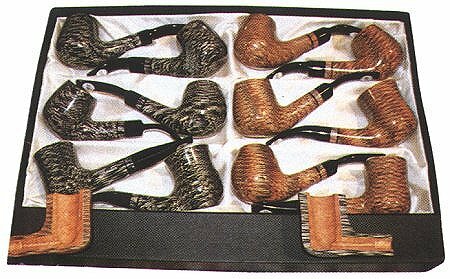 But unlike some major industry directories, you'll also find listings for pipe carvers (briar, meerschaum, clay, and corn cob), as well as smokers clubs and organizations. Cover price is $25 plus $2.50 shipping and handling. Subscribers to Pipe Friendly receive a 20% discount. Subscriptions to Pipe Friendly, by the way, start at $15 annually. Each issue has product reviews, historical essays, and serious advice on pipe smoking. J. Galloway Co., P.O. Box 13781, Torrance, CA 90503, Tel: (310) 549-0439, Fax: (310) 549-4034, E-mail: Gallow@flash.net, or visit the company's website at: http://www.flash.net/~gallow/pipes.html. Denmark's venerable W.O. Larsen has recently made three of its most popular international blends available to the U.S. market. Marketed under "The Master's Blend" brand, these hand blended pipe tobaccos are packaged in resealable tins. Sweet Aromatic is a light, sweet-tasting blend of extra mild Black Cavendish and mature Virginia, with a touch of mild Burley tobaccos flavored with "sweet, vanilla-type flavors," and "fresh fruity notes." It delivers a slow burning, cool smoke, a long-lasting taste, and pleasant "roomnote". Kentucky Gold is a stronger, spicy blend of toasted Burley and Virginia Cavendish, blended with loose- and square-cut goldend Virginia, finished with a loose cut, full-flavored dark-fired Kentucky. Described as a medium strength blend, Kentucky Gold is targeted towards experienced pipe smokers "who appreciate the flavor and good taste of natural tobaccos." Old Belt Ready Rubbed is a rubbed-out flake tobacco named after the tobacco growing region of Virginia and North Carolina where its leaf originates. A blend of mature orange Virginia tobaccos, it is lightly pressed into tobacco cakes which are stored for aging The tobacco is "rubbed-out after cutting. Davidoff of Geneva (CT) Inc., 550 West Stamford Ave., Stamford, CT 06902, Tel: (800) 232-8436.